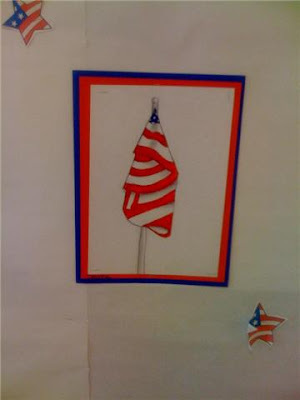 Oodles of Art: American Flags, 4th Grade....SO impressed. 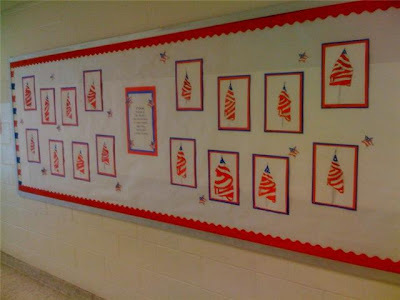 I just want to show you my bulletin board displaying 4th grade's realistic American flags. They are lovely. It's a shame it's not like...memorial day, presidents day, or 4th of july. But heck...I was reminded by one of my colleagues that, "We can be patriotic ANY day!" I, too, am impressed. Nice work! Great display!! Everyone should be really proud of themselves. It all looks very "official"! So wonderful! I am so happy to have found your blog, I hope you don't mind... I am going to link you on mine! Have a happy Tuesday! I would LOVE a Tutorial on this lesson. LOVE it!! Can you please e-mail me a description of how these were done? I too would love to know how you go about teaching this. We are doing a flag day and these would be great. Thanks so much. i would love the tutorial as well! I would love to create this art project in honor of 9/11. It's a simply beautiful. Could you send me some directions? Thank you for your help. Hi, I was wondering if the instructions for this project were ever posted? thank you!! Your site is amazing! Thank you so much for sharing. I too would love a "step-by-step" on the American flag project. We have a Veteren's Day celebration each year and what a wonderful display with would be to honor those who have served from our community. This is a great idea! Am thinking about these for February and President's Day. Could you send the step by step instructions? This is a great idea! Could I get the step by step instructions please? Am thinking about this for President's Day. This is a great idea! Could you please send me the step by step instructions? Am thinking of this for President's Day. Would love the step by step instructions. Could you send them to mr? Thanks.